Guess who the money comes from? Advertisers. But what if it’s an extremist video which the advertiser doesn’t support? Photo by believekevin on Flickr. Rumors that Apple might build a smartwatch started way back in 2011, giving Samsung plenty of time to think about the competitive implications. The company’s top brass at headquarters in Seoul were indeed worried about the Apple Watch, but perhaps for the wrong reasons. Those executives feared that Apple could immediately jump way ahead in the smartwatch race by releasing a device with advanced, clinical-grade biosensors, a source with knowledge of the situation told me. The Apple Watch’s sensors, the executives believed, might take health measurements that were far more meaningful than the step counters seen in wearables so far. They thought the Apple Watch’s sensors might be able to deliver highly accurate measurements of things like blood pressure or blood oxygen levels. In typical Samsung fashion, sources say, the executives in Korea wanted Samsung to beat Apple to the market with its own advanced health wearable. “They especially wanted to get a product announced before the Apple Watch was announced,” one engineer told me. More interested in getting out in front than actually focussing, perhaps? The article is very detailed – Sullivan has really gone into the Samsung corporate culture, which sounds like an utter mess at times. I love the idea of the iMessage App Store. I love Apple’s focus on privacy. I love building on top of an app I use all day everyday. But not only is the iMessage App Store dying —I’m afraid it might already be dead. Five months in, normal people still have no idea where the iMessage App Store is, how to access it, or how to use it. …Using the App Store icon to access the iMessage app drawer doesn’t make sense. I’m guessing Apple did it to highlight the fact that the iMessage App Store was new? But tapping it doesn’t take you to the store — it takes you to either the “Recents” list or to the iMessage sticker or app you most recently used. It’s confused everyone I’ve ever shown it to. iMessage App Store, TV App Store, Watch App Store – the trick doesn’t necessarily repeat. The Mac App Store works, but no developer is calling it a raging success. Human drivers were forced to take control of Uber’s self-driving cars about once per mile driven in early March during testing in Arizona, according to an internal performance report obtained by BuzzFeed News. The report reveals for the first time how Uber’s self-driving car program is performing, using a key metric for evaluating progress toward fully autonomous vehicles. Human drivers take manual control of autonomous vehicles during testing for a number of reasons — for example, to address a technical issue or avoid a traffic violation or collision. The self-driving car industry refers to such events as “disengagements,” though Uber uses the term “intervention” in the performance report reviewed by BuzzFeed News. During a series of autonomous tests the week of March 5, Uber saw disengagement rates greater than those publicly reported by some of its rivals in the self-driving car space. Once per mile. Never enough let you relax. Sure to improve, but what is the “safe” amount? Extremists and hate preachers are estimated by marketing experts to have made at least $318,000 (£250,000) from adverts for household brands and government departments placed alongside their YouTube videos. Google, which owns YouTube, is estimated by internet analysts to have taken a cut of $149,000 from advertisers for its role placing the ads against the content, even though brands did not want their names associated with the hate speech. Wagdi Ghoneim, an Egyptian-Qatari Salafi Muslim preacher who has been banned from entering the UK due to concerns he is seeking to “provoke others to commit terrorist acts”, is estimated to have made $78,000 from adverts placed in anti-western propaganda videos. Adverts placed against Ghoneim’s videos include campaigns by the BBC, Boots and Channel 4. Ghoneim’s YouTube channel, Wagdy0000, is the most popular of the online extremists found by the Times to be benefiting from Google’s programmatic advertising system, which uses algorithms to place brand adverts against any videos. Havas, the French media agency, has joined the British government in pulling all of its digital ad spending from Google and YouTube in the UK, after it was revealed that government and corporate advertisements were being displayed alongside videos that advocate extremism. Havas, one of the world’s largest marketing groups, spends about £175m on digital advertising in the UK annually. 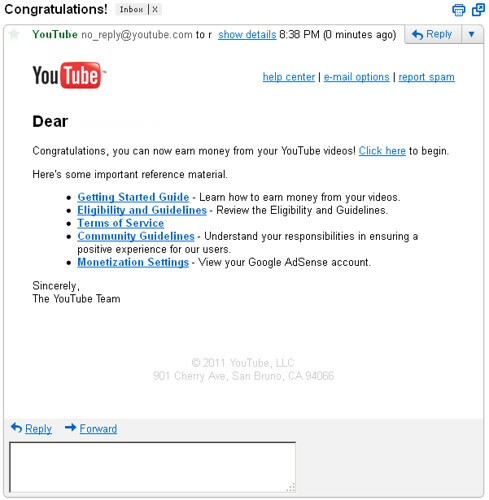 It said it was also considering a global freeze on YouTube and Google ads. The UK government has also stopped its YouTube spending, which is part of a £60m annual budget for digital advertising, until the problem is resolved. This is far from a new problem: in 2012 I edited a piece on precisely this topic at The Guardian. But it didn’t have the same resonance at the time, perhaps because “extremism” didn’t seem like such a problem. Things are changing now. As I presented in my 1989 Voice Manifesto and many articles, the concept of a system based universal adverting system would be repugnant to a vast majority of users. This test [by Google of an ad in Google Home] confirmed the accuracy today as the internet exploded with outrage. Twitter has Google Home trending with over 11,000 negative tweets by 6pm. Ironic how similar issues in advertising played out over a quarter century ago informs the new Voice First revolution. Although Amazon was very successful in injecting advertising on a subsidized version of the Kindle eBook reader, this was a far less interference into the use case. Injecting any form of direct advertising into the base system functions of a Voice OS will statically always be met with the same response history has demonstrated in the past. And thus it was not surprising to observe the rebellion from Google Home users and observers. Simply put, the bandwidth of a Voice First device is the Voice. Anything presented takes over the entire channel of the bandwidth. It is equivalent to taking over the entire screen of a computer or device with 30 seconds of lock out. At the root OS level this not only annoys but signals anger. And today with just a wee bit of a pinky toe in the water Google empirically discovered something I understood before GoTo and Free-PC.com was thought of. I have surfaced over 50 modalities for monetization of Voice First systems. General advertising in the manner Google presented, even when targeted correctly, will cause the response we saw today. I wrote an article in Forbes that addressed this quagmire for Google in 2016. Bill Gross came up with the idea for Free-PC; he also came up with the idea of ads beside search queries. You may be able to think of a company which does that. Oddly, it’s the same one which is now trying to mimic the Free-PC idea. Is Google just recapitulating all Gross’s ideas? Chinese technology conglomerate LeEco is looking to sell a 49-acre Silicon Valley property less than a year after buying it from Yahoo Inc, sources said, in what is the latest effort by the firm to ride out a cash crunch. LeEco, one of China’s most ambitious companies that grew from a Netflix-like video website to a business empire spanning consumer electronics to cars within 13 years, is struggling to support its goals that include beating Elon Musk’s Tesla Motors in premium electric vehicle making. LeEco’s billionaire founder and CEO Jia Yueting admitted in a letter to staff in November that the firm was facing a “big company disease” and battling a cash crunch after expanding at an unprecedented rate. But less than a month prior to the letter, amid much fanfare at LeEco’s official US launch at the Palace of Fine Arts in San Francisco, Jia had outlined plans to build its North America headquarters at the Silicon Valley site. “This property will be an EcoCity that houses 12,000 employees,” Jia said at the time. Live fast, leave a good-looking property portfolio. A new report issued by the National Academy of Sciences says US regulatory agencies need to prepare for new plants, animals, and microbes that will be hitting the market in the next five to 10 years. The new products, the report says, could overwhelm regulatory agencies like the US Department of Agriculture and Food and Drug Administration. Here are some products scientists are already working on that US regulatory agencies aren’t ready for. Most of these look harmless, but the one involving the release of gene-edited animals or insects looks particularly risky. People overplay the risks from GMOs because it suits them; most changes are self-limiting and harmless. And GMO crops or foods can’t, in themselves, harm you. Companies face a complicated choice. Make things easy for the customers, or make things secure for them. Convenience seems to take priority most of the time. This forces companies to get their customers to risk their own security. In this example, we see Verizon Wireless asking their customers to type their passwords into Twitter for everyone to see! This is dangerous. It is likely that many of their customers recycle their passwords. Does the average customer know that their “billing” password is different from their account password? Is it safe for people to post their phone numbers in public like that? Some companies ask for the information via Direct Message. This is also problematic. He’ll explain why. And show you people putting everything out there. In December, Kurt Eichenwald, a Newsweek journalist who has written about living with epilepsy, appeared on the US Fox News show Tucker Carlson Tonight to discuss his claims that the then-President-elect Donald Trump had spent time in a mental institution. That evening, Eichenwald received a tweet from pseudo-anonymous Twitter user jew_goldstein that contained a strobing image and the words: “You deserve a seizure.” The image, we’re told, induced an epileptic fit in Eichenwald, who lives with his family in Dallas, Texas. His wife later called the police when she pieced together what had happened. On Friday morning this week, cops and federal agents arrested in Maryland a 29-year-old bloke who is thought to have sent the life-threatening tweet. John Rivello, from Salisbury, Maryland, was due in court today on charges of cyberstalking. They also got access to Rivello’s iCloud account and found a screenshot of Eichenwald’s Wikipedia page which had been altered to show a fake obituary with the date of death listed as December 2016. Also found were screenshots from the epilepsy.com website with a list of commonly reported seizure triggers. Epileptic seizures can be fatal; your humble hack lost a fellow journalist and friend to the condition. You may joke to your mates that a flashing light or strobing animation gave you epilepsy. For tens of millions of people, a GIF could be the last thing they ever see. One for the lawyers: there is “speech” that can kill directly. What price “free speech”? Growing concerns over an ‘invasion’ of refugees and migrants helped to elect Donald Trump and sway Brexit voters. Yet the data suggest that the situation is very different from how it is often portrayed. 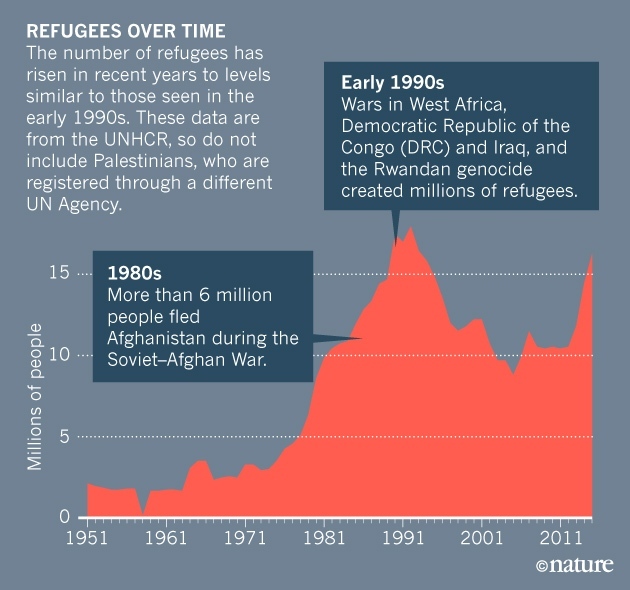 Researchers warn that misleading reports about the magnitude of flows into Europe and the United States are creating unjustified fears about refugees. That is undermining efforts to manage the massive humanitarian problems faced by those fleeing Syria and other hotspots. “The alleged increase in migration and forced displacement tells us more about the moral panic on migration than the reality,” says Nando Sigona, a social scientist at the University of Birmingham, UK. The number of refugees and migrants entering the European Union is low compared with the bloc’s population. Nations in Africa and Asia are absorbing many more. “The number of refugees in Europe is a classic example of perception versus reality,” says geographer Nikola Sander at the University of Groningen in the Netherlands. Nature, if you aren’t familiar with it, is one of the premier peer-reviewed science journals. There’s also a PDF infographic you can download with more detail.